Day of Mourning, Plymouth, Mass., Nov. 22, 2016. The 48th National Day of Mourning will be commemorated on Nov. 23 on so-called “Thanksgiving.” This is a day where Native people expose the myth of the benevolent Pilgrims and expose the reality of the theft of Indigenous peoples’ land, murder of their people and destruction of their culture. It is a day to remember their history and revere their ancestors and the Indigenous people living today in the U.S. and worldwide. 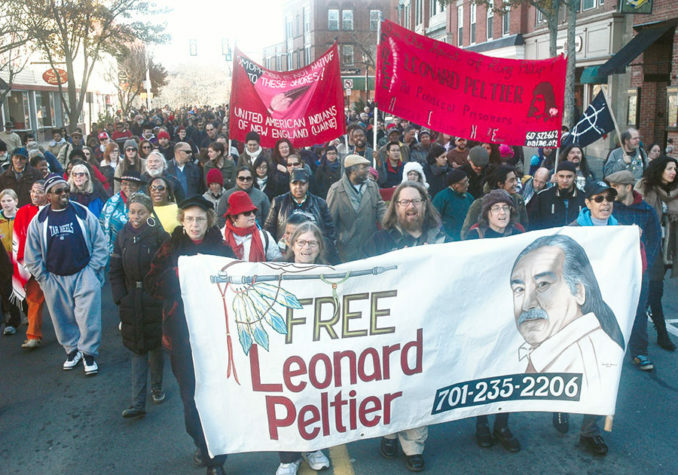 The event will honor 73-year-old Native political prisoner Leonard Peltier. This year’s observance will also honor the people of Puerto Rico, the Caribbean and Mexico, following the treacherous hurricanes and earthquake — and hundreds of years of colonialist occupation and land theft, then corporate and financial exploitation. We join our Native sisters and brothers in condemning the Trump administration’s contempt for and neglect of people of the Caribbean and its outright racist hostility to the people of Mexico from the first day of Trump’s election campaign. While the imperialist U.S. and their allies exploit the peoples of these countries for profit, they ignore them during crises and constantly whip up bigotry against them. Native activists ask that their struggles today not be forgotten — but are raised at activities across the country. There is a high rate of unemployment, poverty and hunger among Native families. Amid the rampant police violence meted out against people of color, it is a fact that police kill Indigenous people at three times the rate of whites. In a senseless act, police killed 14-year-old Jason Pero, of the Bad River Band of Lake Superior Chippewa Tribe, on Nov. 8. See #justiceforjason. 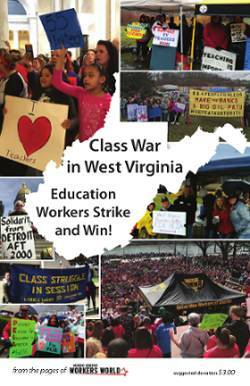 Workers World hails Indigenous people in the U.S. and worldwide who are leading the struggle to save the planet from capitalist profiteers who wreak destruction in their mad drive for superprofits, regardless of the damage to human, animal and plant life. Their determined resistance inspires millions as they fight for the future of planet Earth itself. The victorious life-and-death fight by Native activists and their allies stopped construction of the Keystone XL pipeline in 2016, and won global support. Courageous water protectors, led by the Standing Rock Sioux Nation, fought to stop the Dakota Access Pipeline, which endangers the water supply used by millions of people. Their struggle is having a global impact, as their slogan “Water is life!” reverberates worldwide. Also, First Nations in Canada are strongly fighting the Kinder Morgan Trans Mountain pipeline, a means to transport tar sands across Western Canada. The Indigenous-led pipeline struggles are now at a different phase, but they go on. Standing Rock water protectors and the Keystone encampments have inspired anti-pipeline movements countrywide. Both heroic protests have impacted varied organizations and demonstrations, which now honor Standing Rock and Keystone fighters and address the need to confront environmental racism. The profiteer in chief in the White House did a favor for his Big Oil cronies when he overturned the peoples’ victory and approved the 2,600 mile-long Keystone XL pipeline in March. But its opponents were validated on Nov. 16 when 210,000 gallons of oil dangerously leaked from the first Keystone pipeline in South Dakota, just days prior to Nebraska’s decision on its expansion. The months-long #NODAPL encampment brought out thousands of supporters in a massive show of solidarity. Now, with a pro-Big Oil cabal in Washington, the oil is flowing. But Native and environmental activists have taken the fight to the courts. Reactionary politicians threaten to use “domestic terrorism statutes” to prosecute 84 DAPL water protectors. A growing mass campaign is pressuring North Dakota authorities to #DropDAPLCharges and #Free Red Fawn. Additionally, Big Oil aims to privatize 56 million acres of Native land in their quest for fossil fuels. On their behalf, #45 plans to vastly shrink Utah’s 1.3- million-acre Bears Ears National Monument. Five Indigenous nations fought for decades to finally win protected status in 2016 for this sacred, historic site. Congressional right-wingers are pushing legislation to allow the president to reduce Bears Ears so the energy industry can plunder these lands for oil, gas and minerals. The fight against this theft is on — and it has massive public support. Workers World hails the movement to remove monuments to slavery and colonialism in the Americas — to eradicate statues of those who set off the “conquest of the Americas” and the terror against Indigenous peoples. We stand with Native peoples and their allies in the struggle to win commemoration of Indigenous Peoples Day in place of Columbus Day. So far, they have won this demand in five states and in dozens of cities and towns. The struggle is on!